Do you ever feel anxious and agitated but don’t know where to start to find calm? Or tired and depressed to the point of not feeling able to move? 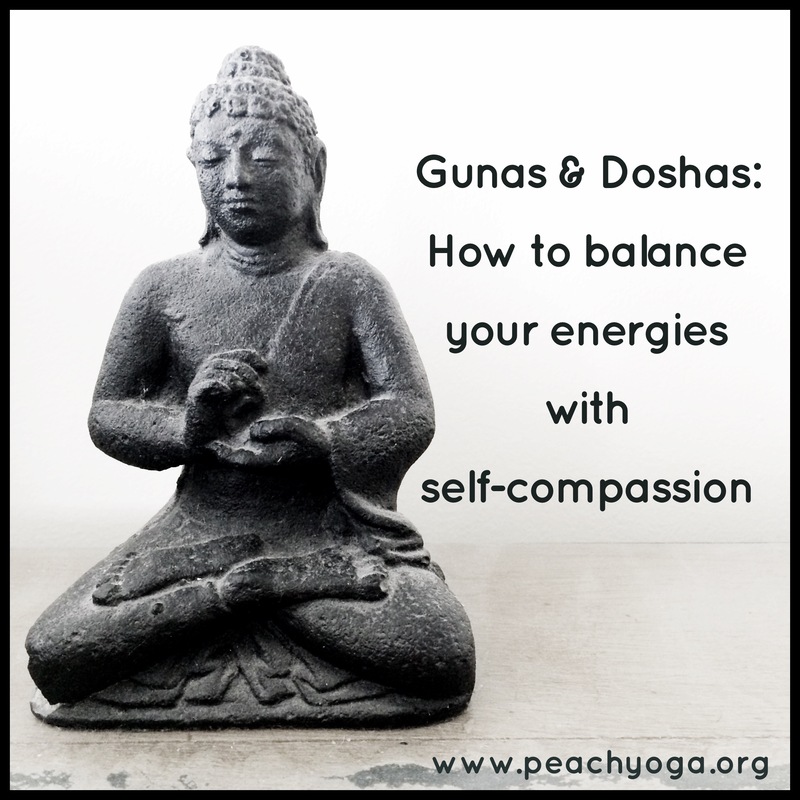 Here’s how exploring Doshas (Ayurvedic constitutions) and Gunas (subtle energies) can help you balance your energy levels with self-compassion rather than through forcing a change. This post comes with a disclaimer: I am at the beginning of my learning journey in both yoga philosophy and Ayurveda, so bear with me if you notice any inaccuracies or contradictions (and please add any comments that might help my understanding). We all have these three Doshas in different proportions, usually with one being more pronounced than the others. But this isn’t fixed – although we have a particular constitution, the balance of our Doshas changes with the seasons, time of day, environment, and stage of life. The aim is to have a balance of all three, and the choices we make about our lifestyle, diet, and other things, can help or hinder this. I know I have a lot of kapha in my constitution. Advice about excess kapha often recommends a vigorous yoga practice, to counterbalance the tendency towards lethargy. This makes sense in theory. But in practice, when I am feeling lethargic, the thought of a vigorous yoga practice makes me want to curl up in a ball – it feels too assaulting to the senses. And I often interpret this advice as a criticism: I shouldn’t be so kapha, I need to fix myself. Which doesn’t feel very yogic! What does work for me is to begin a slow, gentle practice, starting very floor-based with lots of body-awakening. Then I usually find that my energy levels begin to increase and I start wanting to move more dynamically. A few weeks ago I attended an inspiring training course on teaching yoga for stress and burnout with Charlotte Watts and Leah Barnett. And that’s where I learnt about Gunas. And about how we can challenge ourselves in a compassionate and supportive way, rather than assaulting our systems with things we’re not ready for. Some consider that each Dosha is be made up of a particular balance of the three Gunas. Some describe the Doshas as physiological constitutions and the Gunas as psychological or mental energies. And while all three Gunas have their place and value in the world, what we are aiming for is a sattvic state of being. It seems so obvious when you think about it. Start where you are. In a tamasic state, start your yoga practice slowly and gently, gradually working up to a more energetic practice, with self-compassion. The same is true for a rajasic state – you need to balance out that agitation with a steadiness but I know from experience that going straight into a restorative or meditative practice with an agitated or anxious mind feels impossible. In a rajasic state, start with a faster flowing, more energetic practice that incorporates long deep breathing and gradually slow down to a calmer state of being. Approaching your practice in this self-compassionate and supportive way seems intuitively much more likely to lead to balance and calm, than trying to force something that is so opposite to how you feel. This approach to working with my energies is one of the things I’m exploring in my practice at the moment. I’d love to hear your experiences of this too.